U.S. California Representative Eric Swalwell’s phrase for America is “Go big. Be bold. Do good,” to start his speech in Cedar Falls. He visited Cedar Falls to help with the special election for Senate District 30. This election will be held on March 19. Other presidential candidates will visit Iowa before this election. With an presidential election approaching in 2020, many candidates, Democratic and Republican, are officially declaring to run. Even as a small state, Iowa holds a prominent place in how a presidential election begins. The Iowa caucuses are the first major contest of the United States presidential primary season. Because the current president is Republican, all of the challenger action is on the Democratic Party side, but some Republican challengers may also decide to go against President Trump in a primary contest. Recently, 2020 Democratic candidates like Corey Booker, Elizabeth Warren and possible candidates Eric Swalwell and Steve Bullock have visited the Black Hawk County area. Swalwell, an Iowa native, is a U.S. Representative from California’s 15th Congressional District who serves on the House Intelligence and Judiciary Committees. 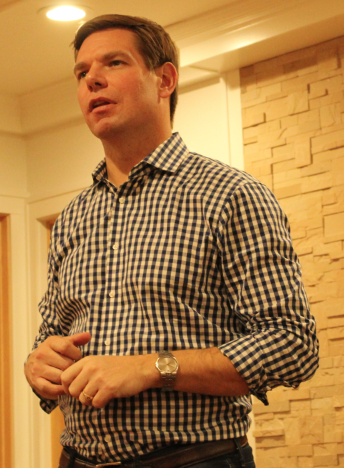 Swalwell spoke at a small gathering in a Cedar Falls home on Feb. 3. Although Swalwell has not officially declared his candidacy, he does have expectations for the upcoming election. “I hope that it is a story of redemption for us, that we redeem the rule of law in America. The rule of law is not necessarily an abstract thing, but we rely on the rule of law to have order, free markets, free ideas and a freedom to dream,” he said. Swalwell illustrated his concern for the country’s political status. “We need to realize that we have a current president that has taken a wrecking ball to it. We need to restore it. This country is not working with everyone right now, so I think we need to have our story of redemption,” Swalwell said. Currently, 14 Democratic candidates are running for the presidential election of 2020. Two Republicans, including President Trump, are vying for the 2020 election as well. Here are the candidates who have announced, and those who are still considering a run for their party’s nomination for the presidency.